i'm struggling with this. on the floor means better coupling and low end but way less clarity/projection. on a stand, table or tilt-back does the opposite, but maybe more replicable results in different rooms. what are your thoughts? what do you tend to do? Put on chair and wedge back at an angle so I can hear myself over the drummer. I've lent my tilt back to one of my mates for a couple of his gigs and the differences were significant. 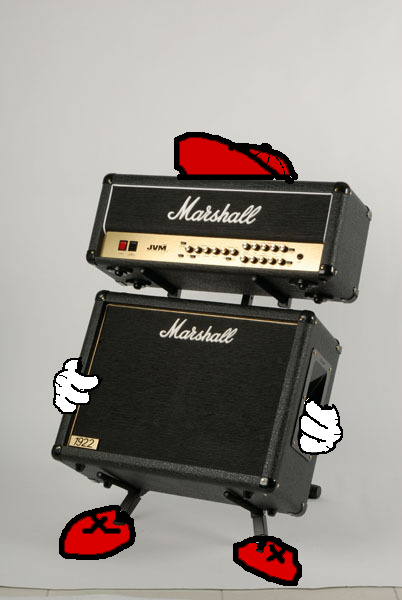 He sings and plays guitar, he uses a 1x12 Marshall and the other guitarist uses a 50w stack with a 4x12. The other guitarist gets a good sound, can be heard clearly etc, my friends guitar was getting lost in the mix and sounded wooly. Stuck it on the tilt back and it was clearer, easier to hear, just generally much better. It wouldn't be needed if there was a proper stage, but these are pub gigs where he is at the same level as the punters generally, so the sound is hitting peoples feet. Complains about news, but actually IS new. Always put my amp on a chair/stand. Those silvertone 1482s get pretty wooly on the floor, and I don't use pedals with it anymore so I really have to use amp projection to get my funky garage rock tonezzz with my 1448. Always off the ground somehow for gigs. The coupling thing: Don't know how much there is in it, but I always wondered why guitar amps don't have spiked feet a la hifi speaker stands. It wouldn't make much difference probably, but would tie in nicely with guitarists being the worst. Always put my amp on a chair, otherwise I end up turning the amp up too loud to try and hear myself. Just bought a little $30 tilt tripod stand from GC last year, gets my drri off the floor, which I feel is better for stage monitoring purposes and audio separation (helps a ton a basement practice environments. one of these just arrived today for my ac15 head and cab! Boy howdy, fellas; this thing sure does weigh a bunch! That is amazing!?!? Want one.